What went wrong in Boston in 2015? Well … kind of a lot. Now that the season has ended and the hot stove is winding up, I thought it might behoove us to take a look at some of the numbers and break down just what’s broken at Fenway. Of those broken things, what could be fixable (the defense) and what needs the full replacement treatment (an outfield bat)? After running down the positional side last Tuesday, it’s time to examine the pitching staff. Scary? Maybe. Any cause for hope? A little. Let’s dive into the numbers. So, uh, how about that Rick Porcello, everyone? We knew going into the season that the notably ace-free Red Sox weren’t exactly going to set ERA records in 2015. Sure enough, they didn’t. But, believe it or not, the starting rotation isn’t what tanked the Red Sox in 2015. That’s the major league leaderboard for starting pitchers, sorted by BP’s Deserved Run Average. And that’s Boston at #5 in the big leagues. Sure enough, the Red Sox starters performed pretty admirably as a unit. So how’d that happen? Well, it probably has to start with two pitchers who were pretty awesome for half a season each: Clay Buchholz and Eduardo Rodriguez. Clay and Ed were the yin and yang of the Sox 2015 rotation, slanted reflections of each other. Buchholz was the closest thing to an ace that the Sox had coming into 2015, but couldn’t be counted on to stay healthy. True to form, Buchholz started strong, but his elbow failed him as the season went on. In the end, he logged 113 quality innings, posting a DRA of 3.36 (pretty great!) and an FIP of 2.66 (really great!). Of course, as is Clay’s wont to do when pitching well, he was injured. He can’t seem to make it through a full season, and he closed up shop in mid-July. At the end of May, Eduardo Rodriguez made his major-league debut and held Red Sox Nation in the palm of his hand. His stellar first couple of starts pushed expectations sky-high. We’ve made covering #Ed kind of a cottage industry here at BP Boston, from comps to Alex Skillin’s continuing “continuing education” series. Perhaps Eduardo wasn’t quite the dominator that Clay was on a consistent basis, but his DRA of 3.46 and FIP of 3.90 were just fine, thank you very much. While the team would love to see his strikeout rate improve, as well as stay whole and healthy, he’s established himself as a perfectly-good middle-of-the-rotation starter, even in the challenging American League. So with half a great pitcher, and probably one whole good one, that leaves an average guy: Wade Miley. Miley did, well, almost exactly what he should’ve been expected to do. Miley ate innings, and posted good-but-not-great numbers doing so. It’s almost funny; his ERA was 4% worse than league-average and his FIP was 4% better. He posted numbers almost entirely in line with his past two seasons in Arizona, and stuck to an average level of performance like he was glued there. There were also some small wins in terms of performance here and there. Henry Owens debuted, and he’s looked pretty good over his first 10 starts. He could certainly stick for next season. And I’d write up Rich Hill here, but he’s a goddamned unicorn. All I can say is that he deserves a shot in the rotation during Spring Training, and that I have absolutely no faith that he’ll be any good. But he might be. To be continued. So not only were there some bright spots in terms of specific 2015 performance, but there’s some hope for the future. Miley should stay Miley. Eduardo Rodriguez looks real, and between Clay Buchholz and/or Henry Owens, another slot in the rotation might be pretty good. Buuuut … then there’s Rick Porcello. 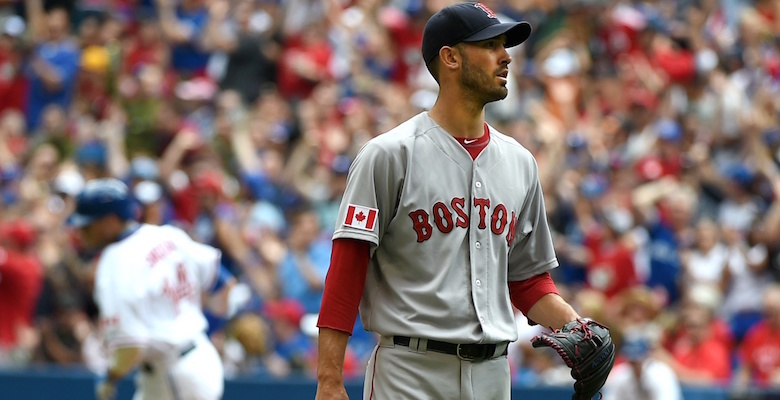 Porcello was an unmitigated disaster in Boston, a failure in the first degree. He needs another chance to prove he’s at least the pitcher he was in Detroit, if not the pitcher the Sox want him to be. According to cFIP, which is a pretty good true talent measure, Porcello was roughly similar to last year as he was last in terms of peripherals. His cFIP in ‘14 was 99, his cFIP in ‘15 was 99. Porcello went wildly wrong, Joe Kelly went pretty wrong (but he has great stuff! ), and the simple fact that the Sox needed to cycle through a fair number of starters is something that went wrong. Beyond that? The rotation is pretty okay. There is room for improvement here … be it from Porcello, from an improving Owens / Rodriguez combo or, most likely, from a new addition in the last available rotation slot. Dollars to donuts, I’d bet that Dave Dombrowski would be interested in adding another higher-end rotation piece, and likely by trade. Improvement would be good — very good — but things don’t look quite so dire here. This isn’t the most fair: Tommy Layne was a bit above-average, and Robbie Ross and Junichi Tazawa were about average. But really, in an era where relievers strike out batters like it’s going out of style (it’s not), the bullpen should be an asset that makes Red Sox starters breathe a bit of a sigh of relief as they hand over the keys. In 2015 it wasn’t, and there’s no reason to think 2016 should be markedly different. Those four pitchers I mentioned, Uehara, Layne, Ross, and Tazawa, all very well could come back next year, but banking on improvement isn’t really a great plan. The rest of the bullpen? It might be better if they disappear. The only guy with real potential out of the bunch is Matt Barnes, and I think you might be tired of waiting on Matt Barnes’s potential by now. No, this bullpen needs a complete overhaul. As a unit, the ‘pen had a 4.56 FIP, dead last in baseball. The team’s 4.31 ERA only surpassed the Braves, Rockies, Tigers, and Athletics. These teams all have something in common: futility. Adding average-or-better relievers could be the ticket to improving this team by wins right from the jump. Though a great bullpen only gives a team a handful of wins above replacement (four to six, if you’re both good and lucky), the Red Sox were either replacement-level or worse, depending on how you pick your poison. Well, the good news is that there’s a lot of room for improvement here. Adding two or three people who aren’t Craig Breslow or Alexi Ogando might be a good start. The bad news is, well, you know what the bad news is. It could take some luck to make this work, if not skill. So after running through all the holes and the weaknesses, after looking back on everything that went wrong, here’s my primary takeaway: the Red Sox have a fair number of holes to fill, but they’re ones that can be filled. No, they can’t be filled internally — the team will have to go out and find these players on other rosters — but the hard work of adding new pieces to complement the existing ones can be done. It’s not likely that everything will break down, and with a couple of savvy acquisitions and some luck, the team could be back in it again within a year or so. That’s a bit easier said than done, of course. Look at the Padres and the White Sox if you want examples of how reaching out and grabbing external players to serve as all your missing pieces can go sour. But the Sox have resources: money, prospects, and intellectual capital. They’ll be okay. Probably. Maybe. But chances are that 2016 will certainly be more exciting than 2015. There doesn’t seem to be anything coming from the minor league clubs to help this bull pen. Not immediately. I’m setting my mind to work on exactly how a man would go about trading for those kinds of pitchers. The big money spent on players could have been used to get decent relievers. Mookie, Boegarts, Pete and Ortiz are solid players. Bradley Jr. has finally made the big leagues. Pitchers were taken out when they were hot, to replaced by has-been bum relievers. The new General manager needs to be a guy with baseball savvy. Pedro comes to mind.